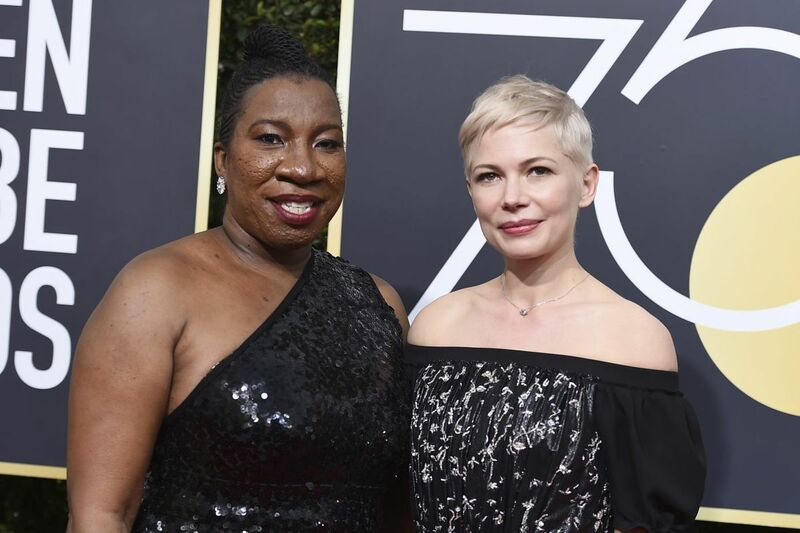 Tarana Burke, founder of the #MeToo movement, and Michelle Williams, a supporter of Time’s Up, attended the 75th annual Golden Globe Awards on Sunday. Workplace harassment and abuse took center stage at the awards show. In the wake of 2017's explosive #MeToo movement, the equally charged and Hollywood-supported Time's Up crusade took center stage at Sunday's Golden Globes. America's conversation about abuse is finally getting the attention it deserves, and while that's a welcome development, the topic of abuse prevention is not a new idea. Child advocacy centers have long been touting the rules that pundits are calling for now; particularly the guidelines around how and when survivors have to relive the abuse they endured. These disclosure rules are guided by the principle that abused children need the legal process to be streamlined in order for them to heal. Little did we know that while we painstakingly curated and safeguarded these disclosure rights for children, adults were also falling victim to similar voicelessness. In many workplaces, victims of sexual harassment and misconduct are forced to navigate a patchwork of reporting mechanisms (if any exist at all) that are either inadequate or put the accusers in direct contact with whomever they are accusing. This has been highlighted on Capitol Hill, in Hollywood, in Silicon Valley, in publishing, and in almost every other setting where power dynamics are at play. I'm a proponent of a much different reality. When child victims of abuse navigate the system by way of child advocacy centers, they are removed from the chill of a police department and introduced to a compassionate environment where they only have to recall the details of their experience once. All workplaces should look to this model for how any victim is treated, insulating people from shame and imploring more to come forward as a result. I began volunteering for Mission Kids, the center founded by former Montgomery County District Attorney Risa Vetri Ferman, when I was 13. I met many other stewards of children as a result — detectives, police officers, attorneys, and forensic interviewers. These members of law enforcement come to Mission Kids to align around one goal: to protect children not only from abuse, but from the trauma associated with the harsh legal system they endure in its wake. Last year, I invited some of those people to my house to share testimony for a video commissioned to highlight stories of the kids we serve. The experience among the child advocates sitting before the cameras was vast, and soon after they began, photographer Susan Beard — who designed the shoot's set — began to cry. Listening to the stories of abuse triggered her memory, and through tears, she confided a troubling experience she suffered as a young woman. As I absorbed Susan's story, I thought of the little girls in my life. I cringed at the idea of any of them knowing her pain. What felt worse was the notion of that pain following them into adulthood if not treated and addressed with the proper procedure that a child advocacy center can provide. Susan told us that shining a light on her vulnerability in the company of understanding professionals felt therapeutic, and that she finally felt free of the burden of carrying a secret. She is a perfect example of why we need to establish safe, protective environments for all victims. Adult victims of sexual harassment need safe zones just as much as young people do. It's in these safe zones where healing can begin, seeds of justice can be planted, and all victims can begin looking past their traumatic experiences. Sexual trauma creates an expensive wound, carrying an average lifetime fiscal impact of more than $210,000 per child, according to a study published by the Centers for Disease Control and Prevention. While firing talk-show hosts and removing abusers from power is a must, those actions fall short of what our new narrative needs to effect change. A robust and efficient means of protecting victims in the midst of their disclosure, without fear of reprisal or the risk of humiliation, is equally important, and must exist for adults and children alike. Creating these safe spaces to tackle uncomfortable conversations with intention, even when they make us want to look away from the problem, is the only way to enact change. This is the reason I dedicated the Childhood Resilience Foundation to facilitate these dialogues with kids and families. We know that the spaces we create when individuals are at their most vulnerable will affect the trajectory of the rest of their lives, just as we know that the way we speak to children becomes the tone of their inner voice. My hope is that employers will follow our lead to equip victims with the tools to come forward sooner, and that doing so will mean an end to their duress.